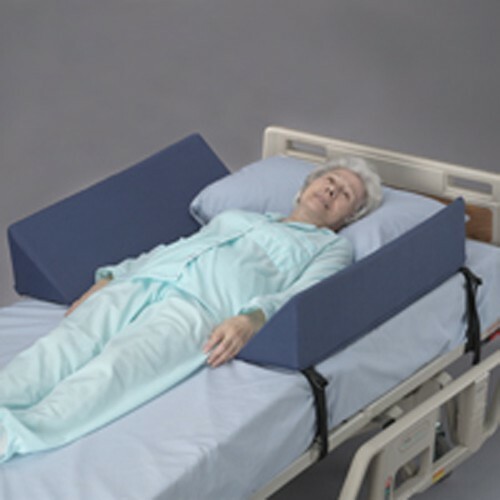 Soft Rails help prevent patients from falling or rolling out of bed, and they can also be used as a Positioning Device. Manufactured by Posey, these Rail Protectors connect to the bed with quick-release buckle straps. They allow sufficient space for patient comfort and can be easily positioned to accommodate individual resident needs. These Safety Rails use a foundation mat that secures to the moveable part of the bed. The bolster rails then attach to the top of the mat with hook and loop fasteners. This allows the rails to be easily adjusted without having to move the foundation mat. The soft rails will not disrupt the raising or lowering of bed rails. They are available in two cover material types, fleece (brushed polyester) and vinyl. Fleece covers are machine washable and vinyl covers can be wiped clean with liquid cleaners. Replacement covers can be purchased separately. Do these soft posey rails work on a regular bed. As long as the bed that will be using the rails matches the measurements of the rails this product should work well.